What Does It Mean to Score a Ham Hock? Use a bird's beak knife to pare oddly-shaped vegetables, or trim them into decorative shapes. A professional cook's toolkit contains more knives than most home cooks use, each with its own special purpose. One example is the bird's beak or "parrot-bill" knife, a specialized paring knife that's curved like a parrot's beak. The blade's concave arc makes it easier to achieve a clean cut on a curved surface, so it's especially useful for peeling irregularly shaped fruits and vegetables. Traditionally the same knife is used to shape the "tourneed" -- or "turned" -- vegetables you'll still see on the plates of some high-end restaurants. Grasp the bird's beak knife by placing your thumb and forefinger on either side of the blade, just where it meets the handle. Wrap your remaining fingers around the handle, to hold it steady. You'll move your thumb from the blade as you work, but this is the standard chef's grip on a knife. Pick up your first vegetable or piece of fruit and examine it for blemishes. Use the pointed tip of your knife to gouge those out. Position the arced blade near the top of your piece of produce. Move your forefinger from the side of the blade to its back, where you can exert some downward pressure. Extend your thumb to the bottom of the fruit or vegetable, where it will anchor your hand during the cutting stroke. Press down with your forefinger to start the cut, while simultaneously clenching your hand to bring your fingers -- and the knife -- toward your thumb. Use a steady, even pressure. If you're too enthusiastic, there's a chance the blade could slip on the fruit or vegetable and cut your thumb. Turn the vegetable or fruit slightly, and make a second peeling stroke alongside the first. Repeat, until the entire fruit or vegetable is peeled. Keep the knife at a shallow angle, so the peel comes away with a minimal quantity of flesh attached. Cut your vegetables into oblongs with a larger chef's knife or utility knife. The largest traditional size is 2 1/2 inches long and 1 1/2 inches square, and usually represents the easiest starting point for a novice. Position your thumb against the bottom of the vegetable, and place your bird's beak knife at the top so that the far end of the vegetable is cradled in the curve of the blade. Your starting point should be on the midline of the vegetable. Draw the knife the length of the vegetable, making a single long, arced cut. Your goal is to start at the midline of the vegetable, curve outward to leave it as thick as possible, then cut more deeply again to finish near the midline of the vegetable at its other end. Your vegetable will still have an oblong shape, but the side you've trimmed will have a curve like a rocking chair’s rocker. Rotate the vegetable and make a second cut just like the first. 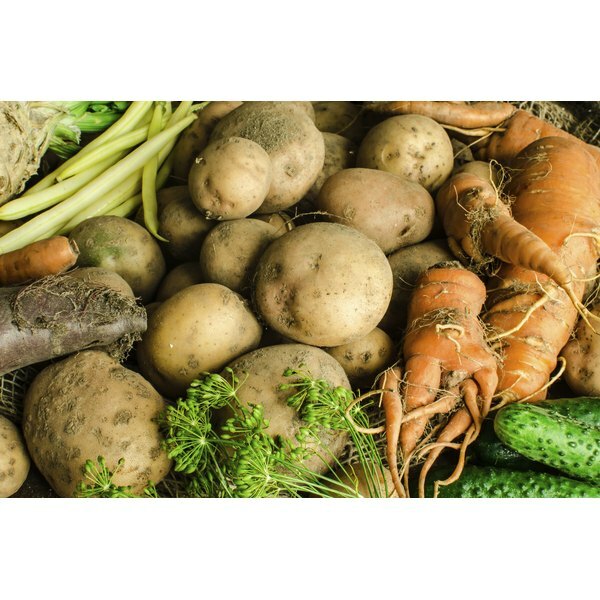 Dense vegetables such as potatoes and carrots traditionally are cut to seven flat sides, and softer vegetables such as zucchini and cucumbers are cut five-sided. You'll need to estimate how far to turn the vegetable each time, to achieve the desired classically symmetrical appearance. Repeat for each additional piece of cut vegetable, until you've given them all the shape of a slightly flattened football. It takes lots of practice to do this accurately by "eyeball," so don't be discouraged if your first several attempts are ragged and uneven. Professionals learn this skill by doing thousands of vegetables, so you can't expect to become a master turner of vegetables by the time you reach your third potato. Potatoes are usually the easiest vegetable to practice on, if you wish to learn how to tournee vegetables. They're dense enough to handle easily, but their texture is relatively soft and -- unlike carrots, for example -- they have no distinct "grain" or growth pattern to complicate your work. A bird's beak knife is also ideally suited for deveining shrimp. The curved blade neatly splits the shrimp down its natural seam, and with the thin, pointed tip it's easy to lift out the shrimp's dark-colored digestive tract. Wash the vegetables or fruit before you start, in the interest of food safety. When you begin to use your knife, its blade will carry any bacteria or contaminants from the skin to the edible portion. What Happens if You Cook Chicken With the Giblets Still Inside? What Cuts Come From Whole Boneless Sirloin?